I thought I would visit an impressive collection of books. I had no idea we were about to be given a tour of the most significant, volcano-damaged, Greco-Roman library in the world. There was plenty of security and form-filling, and then we were taken up stairs and lifts, and all angles of corridors until we reached a small room at the back of everywhere. It was here that I first got a sense that this would not be an ordinary library tour. 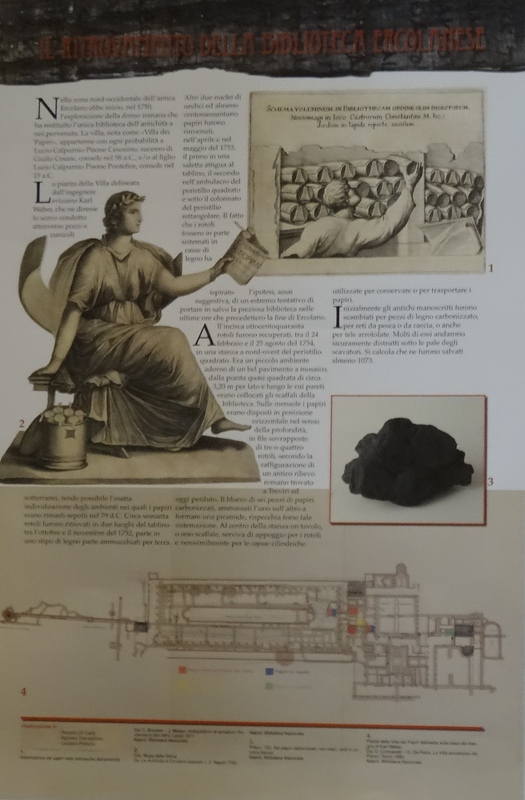 In a book-lined room with a projector we were given a half-hour talk in Italian about the ancient texts I hadn’t known we’d come to see – the Herculaneum papyri. Thanks to a helpful translator and a useful English summary I was able to follow most of the short lecture. To say I was surprised is an understatement. I was amazed. 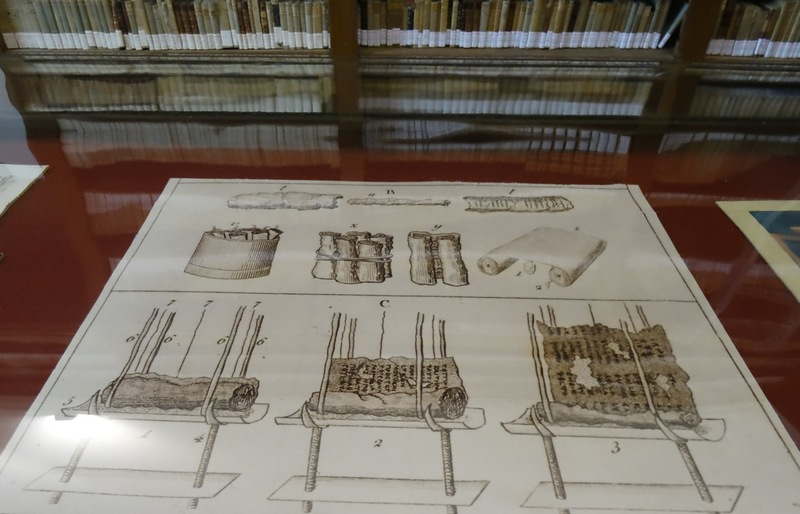 I hadn’t realized that these papyri scrolls existed and I hadn’t expected to find such a unique library/museum hidden behind scaffolding, high above the streets of Naples. Here’s a little information on the scrolls. 1. They were buried and singed to lumps of char beneath up to 25 metres of fallout from the AD79 eruption of Vesuvius. 2. They were not found for over 1,500 years. It was in 1752 that they were discovered when excavations were begun on a villa in Herculaneum believed to have belonged to Julius Caesar’s father-in-law, Lucius Calpurnius Piso Caesoninus. 3. Much of the library discovered so far is the work of a long-term guest at the villa, Philodemus of Gadara, who was a follower of the pleasure-approving Greek philosopher Epicurius. 4. When the scrolls were first found they looked so like charred pieces of wood that nothing was done with them until one was dropped by accident and faint lines of lettering were revealed. 5. Over the years since the discovery of the scrolls many enthusiasts have attempted to stretch open the fragile lumps yet, despite their efforts, enough of the papyri still survive to build this rare library. 6. Abbot Antonio Piaggio, conserver of ancient manuscripts in the Vatican Library, was the man who finally devised a machine to open the scrolls. In 1756, after months of work, he opened a three metre scroll which had forty columns of text (some of the scrolls are 23 metres long but the norm is around nine to ten metres, and they are only 19 – 24cm high). 7. 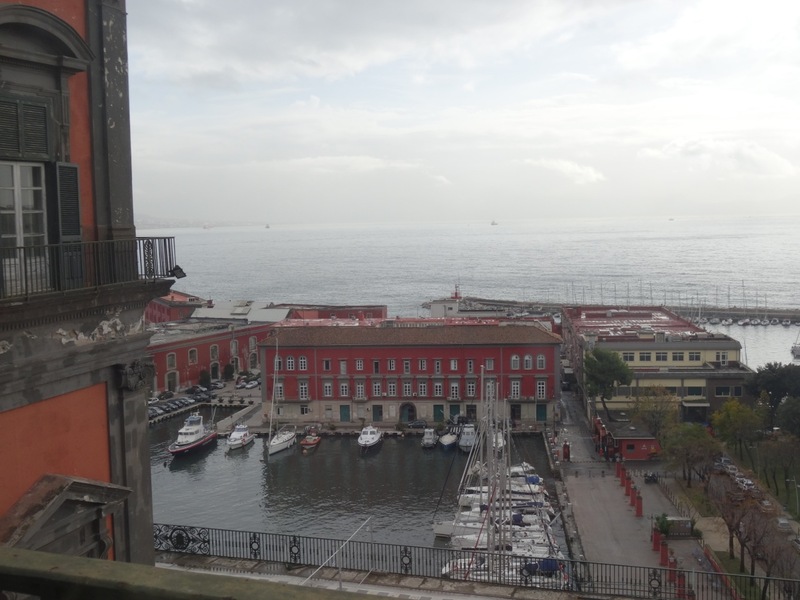 Transcribing work is still going on today and much of it in Naples. On our visit we saw a handful of academics hunched over their microscopes and the millennia-old fragments. The work is so inchingly-slow and meticulous it’s painful even to imagine. Yet the academics will not give up. As one told me each letter deciphered adds a fraction more to a library that has taken generations to build – a library that only exists today because of the precision and determination of a few against roasted, unreadable odds. 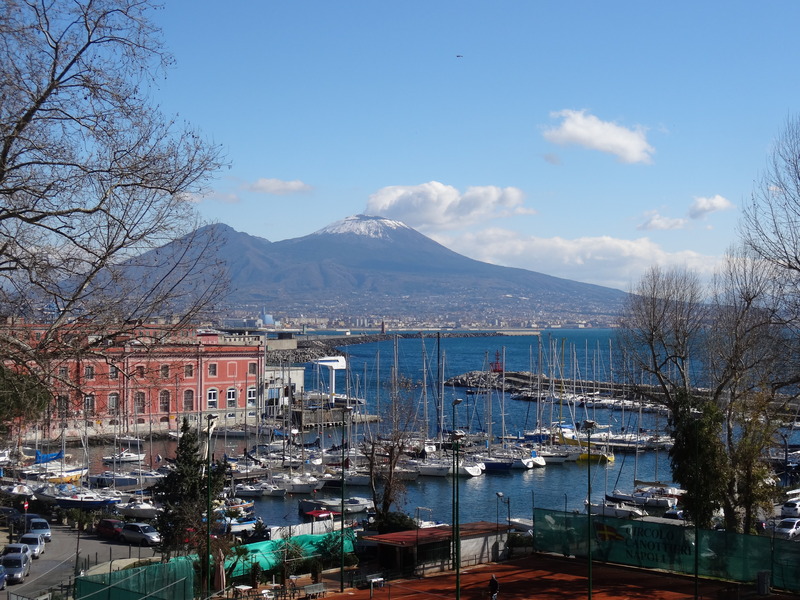 I stepped outside, back into Naples, with a view across the bay to Vesuvius – a reminder of the brutal truth about appearances. This is the latest news on the scrolls. It seems that developments in X-ray techniques may now be on hand to help. It is possible to arrange visits to the library. Please click on this link to find out more. 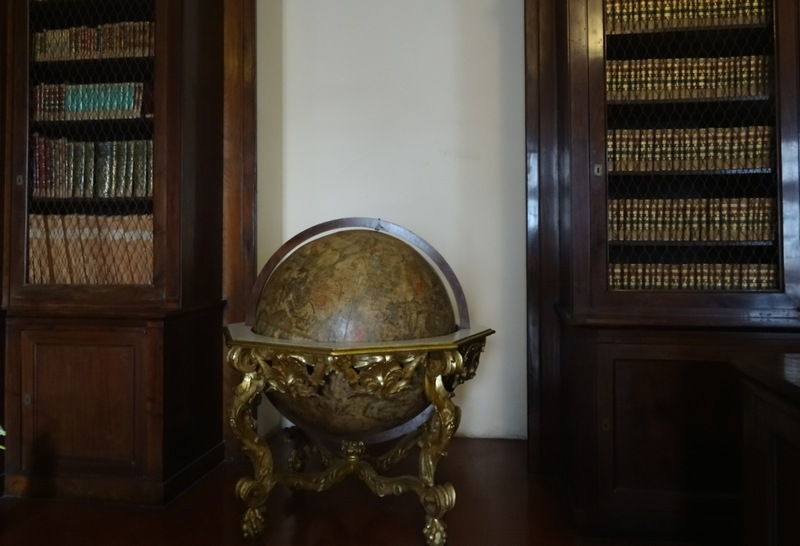 This entry was posted in Naples, Other discoveries in Naples and tagged Biblioteca Nazionale di Napoli, Epicurius, Greco-Roman library, Herculaneum, Naples, papyri scrolls, Philodemus of Gadara, philosophy. Bookmark the permalink. Took me completely by surprise!